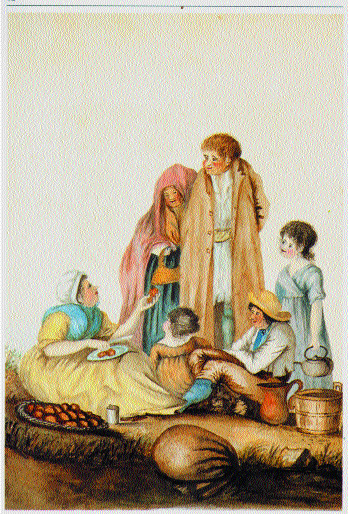 A 19th century depiction of the rural poor in Ireland. Padraig Lenihan talks to John Dorney and Cathal Brennan on Near FM’s History Show about life and death in 17th and 18th century Ireland. The records of the population of early 17th century Ireland are rather sketchy at best. It is thought that in 1600 around one million people lived in Ireland. Somewhat ironically the first really detailed demographic details we have about the population of early modern Ireland arise from the greatest human catastrophe in its history – the Cromwellian conquest. (For the general context see here). Here, historian Padraig Lenihan talks about how many died in the ‘war that finished Ireland’ to quote a contemporary poet. The Cromwellian map maker William Petty thought 40% of the population had died but Padraig estimates that it was in fact closer to 20% – still calamitous but not so much so as thought at the time. Despite losing some 20-40% of its population due to war and famine from 1641-53, Ireland’s population still doubled over the course of the 17th century from around 1 million to two million inhabitants. What is really surprising is how quickly the population recovered from this disaster. By 1700 the population is estimated at over two million. One reason for the was immigration, primarily from England and Scotland. Though some thousands of these settlers died in the rebellion of 1641 and afterwards, this did not really affect Protestant numbers in Ireland. Particularly because, as Padraig discusses, most Scottish migration to Ulster took place well after this period, in the 1690s – fleeing famine in lowland Scotland. Inward migration however was not the whole story in the population rise by any means. Significant numbers also left the country in these decades – particularity Catholic movement to Europe and (often forced) to the West Indies. So how did the Irish population still double? Padraig concludes that Irish women were simply marrying earlier and having more children than their counterparts elsewhere in Europe. They appear to have had at least five children each – considerably more than in England. Add in the introduction of the potato as ‘a cheap and abundant food stuff’ for the rural poor in the late 17th century, allowing the small farmer to sell his other crops rather than eat them, and the death rate due to malnutrition also tailed off. A depiction of different social classes in 1600s Ireland. However this was hardly a period of plenty for most of the population. One hundred years after the Cromwellian catastrophe there was another calamity – the famine of 1740-41 – caused by an unusually cold winter. This famine, compounded by typhus and dysentery, killed hundreds of thousands of poor Irish. Nevertheless afterward the population continued its upward curve into the 19th century when it eventually peaked at some eight million before tailing off after another terrible famine – The Great Hunger in the 1840s. Today the population of the island of Ireland stands at about 6 million, but unlike the early modern period, most of these live in urban centres, so is most unlike that of previous centuries. At first glance early modern Ireland looks a little like the modern developing world, with rapid population rises checked periodically by natural or man-made disasters. However Padraig Lenihan cautions against such parallels. The essential difference being that in the modern world including in what used to be called the ‘Third World’, modern medicine has also meant that death rates have fallen sharply, meaning that population growth is still in ‘vertical take off’. Written by: John_Dorney on 22 January, 2014.on 24 January, 2014.